Viplav applied appointments on dhani’s wound and said it seemed thunderstorm would come. Dashrath said he had to stop This Storm else everything would be ruined. Kanak said nobody could stop Viplav. Dashrath asked her to take a bowl and beg on streets of Banaras. Dashrath sang a song. Kanak asked what happened. He asked if his sure was okay, and thought would get money by singing bhajans in Temple but would become ordinary Pandit and not Mahant and asked kanak to make food at someone’s house. He said jiji will kick all of them out, and she gave him everything, and he took that didn’t keep the promise. He said Viplav had ruined everything. Kanak promised she wouldn’t let that happen. She said Dhaani would beg as she had a way. Dhaani’s mangal sutra beads fell. Kanak came and picked them up. Dhani said the thread was broken. Kanak stated that they hid from Dadi Bua, and she would shatter by the truth. She stated that they couldn’t explain to viplav. Dhani he was angry and wouldn’t agree. Kanak said she could understand as Dashrath would be insulted. Dhani said she didn’t understand. Kanak asked her to go for two days until Dadi Bua went. Dhani said what she would tell Viplav. Kanak said she could tell him in the letter. She said he would come to take her home. Kanak said she could do what he couldn’t. She acted and stated that they were in a dilemma, and she knew she saved him twice but Bua ji kept him when he was a small kid and Viplav was because of her else he wouldn’t be alive. Flashback was shown doctors told Bua and Kanak that his treatment was not affecting the child. She said Dadi but fasted for three days and prayed God, and Viplav got saved because of prayers. She said Dashrath gave Viplav to Dadi Bua and was forced to lie about marriage. She said if she lied she would have doubted on her. She said Dashrath had accepted her as Bahu and asked why he would do that.she said if she thought herself as Bahu then she would come and take her and was sure she wouldn’t disappoint her. Dhani held her hands with teary Eyes. Kanak threw her fake tears before going. Dhani cried. Viplav came to the room and called Dhaani. He said he would tell everything to Bua and couldn’t bear anymore and looked for Dhaani. Kanak came to Dashrath and said Dhaani left. She said what Dadi Bua couldn’t do, she did. Dasrath got happy and sad song happily and said it was good now that inauspicious girl couldn’t come back home. Viplav asked servants. They told she left and would return at the right time. Kanak informed Dadi bua that Dhaani left. Dadi Bua said that it was good she left and asked her to call everyone to make an important announcement. Kanak said okay and went. 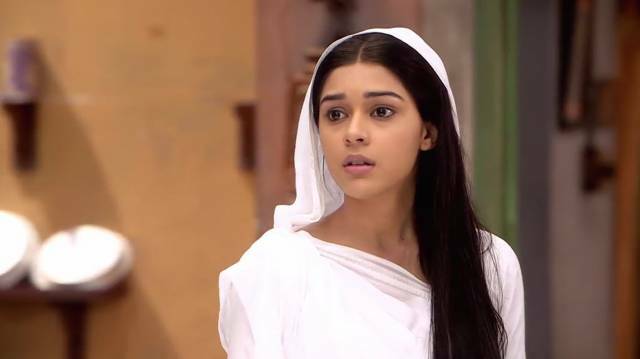 Dhaani was seen walking on the road and crying thinking about Dadi Bua’s accusation on her character. Viplav came in his car and called her name and held her bag and asked why she was leaving. Dhaani told she was helpless. Viplav said he was also helpless and reminded of promise to stay together, and drama would end today with truth. Stay tuned for latest IKRS news and updates.